Surf Scoter: Ralph Hocken Photo. The Tuesday Bird Walk went to Columbia Beach. Seventeen birders saw and heard thirty-nine species of birds during a beautiful sunny fall morning. Among the highlights of the morning were the sightings of one Long-tailed Duck, a large raft of Surf Scoters and White-wing Scoters and several Black Scoters who entertained us with their singing throughout the morning. We spotted a Merlin chasing some song birds and a Cooper's Hawk put in a brief appearance. Several Pacific Loons, still in breeding plumage, with gorgeous silver necks and heads, were bobbing in the water. Four Dunlin, two Black-bellied Plovers, several Black Oystercatchers and a Killdeer were seen near the gravel bar. Large flocks of Harlequin Ducks flew past us and landed on the water within our viewing range. number, along with the date, name and location of your sighting. The Sunday Bird Walk went to the Nanaimo River Estuary in south Nanaimo. 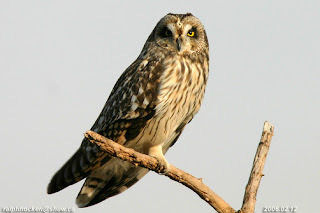 Among the highlights was the sighting of two Short-eared Owls hunting just above the grasses. We had six sightings of Northern Shrike hunting and perching for a short periods and were fascinated by a female Northern Harrier flying just above the ground. Great Blue Heron, Mallard, Northern Pintail, American Wigeon, Green-wing Teal, Common Merganser, Bald Eagle, Merlin, Northern Harrier, Short-eared Owl, Northern Shrike, Wilson's Snipe, California Gull, Thayer's Gull, Glaucous-winged Gull, Downy Woodpecker, Northern Flicker, Steller's Jay, Northwestern Crow, Common Raven, Red-winged Blackbirds, American Robin, Spotted Towhee, Song Sparrow, Golden-crowned Sparrow, White-crowned Sparrow, Fox Sparrow, Lincoln's Sparrow, Chestnut-backed Chickadee, Ruby-crowned Kinglet, Golden-crowned Kinglet, Brown Creeper, Bewick's Wren, Purple Finch, Pine Siskins, American Goldfinch, House Finch. Five Trumpeter Swans were seen heading north-west over Morrell Sanctuary in Nanaimo. Two Anna's Hummingbirds are feeding along Valecourt Avenue in Courtney. A female Cassin's Finch was seen at a bird feeder and a immature White-throated Sparrow was spotted in the same area at Jordon River. A Redhead Duck and several Mallards were see at the Goodridge Peninsula in Sooke. A Pine Grosbeak was seen along Ermineskin Avenue in Parksville. A Bufflehead and a Wilson's Snipe were seen at Englishman River in Parksville. Several Red-throated Loons were seen off Sebastion Road in Lantzville. Two Pileated Woodpeckers and a male Anna's Hummingbird have been visiting feeders along Denford Place in Nanaimo. A Dunlin was seen at French Creek. A Brown-headed Cowbird was seen along Ermineskin Avenue in Parksville. 50 American Widgeons, 20 Ring-neck Ducks, one Common Merganser, one Bald Eagle and several Mallards were seen at Cottle Lake in Nanaimo. The Tuesday Bird Walk went to the Englishman River Estuary, Shelly Road side in Parksville. Eleven birders saw and heard fifty-four species of birds during a sunny fall morning. It turned out to be a great morning to observe raptors in the area. We saw a Short-eared Owl flying east high over the estuary. There was a Peregrine Falcon perched in a conifer tree and we watched it through the spotting scopes for about five minutes. As we were watching some Northern Pintails fly over the Estuary another Short-eared Owl flew in low to the ground and began hunting over the fields. A Red-tailed Hawk flew over us. A Sharp-shinned Hawk flew out and quickly back into the bushes along the trail. A Wilson's Snipe made a quick appearance and disappeared into the bushes. There were big flocks of Bushtits and Pine Siskins flying about though out the walk. 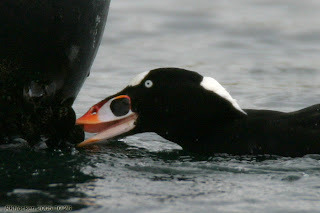 Pacific Loons, Surf Scoters, White-winged Scoters and Black Scoters were bobbing in the water. Canada Goose, Eurasian Wigeon, American Wigeon, Mallard, Northern Pintail, Green-winged Teal, Harlequin Duck, Surf Scoter, White-winged Scoter, Black Scoter, Hooded Merganser, Common Merganser, Pacific Loon, Horned Grebe Great Blue Heron, Bald Eagle, Northern Harrier, Sharp-shinned Hawk, Red-tailed Hawk, Peregrine Falcon, Wilson's Snipe, Mew Gull, California Gull, Thayer's Gull, Glaucous-winged Gull, Short-eared Owl, Belted Kingfisher, Northern Flicker, Pileated Woodpecker, Steller's Jay, Northwestern Crow, Common Raven, Chestnut-backed Chickadee, Bushtit, Red-breasted Nuthatch, Brown Creeper, Bewick's Wren, Winter Wren, Golden-crowned Kinglet, Ruby-crowned Kinglet, American Robin, Varied Thrush, European Starling, Spotted Towhee, Song Sparrow, Golden-crowned Sparrow, Dark-eyed Junco, Red-winged Blackbird, Brewer's Blackbird, House Finch, Pine Siskin and American Goldfinch. A Rufous Hummingbird was seen visiting feeders along Gulfview Drive in Nanaimo. 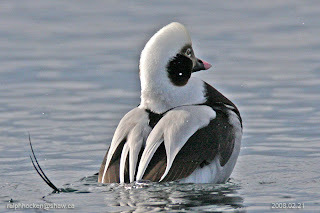 Long-tailed Ducks were seen offshore at Deep Bay. Monday October 27, 2008@ 7:30 pm. The Tuesday Bird Walk on Tuesday October 28 will be going to Columbia Beach. The Sunday Bird Walk on November 02, 2008 will be going to the Little Qualicum River Estuary In Qualicum Beach. 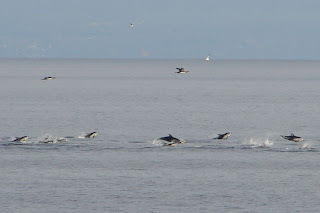 Meet at the Bird Store in Nanaimo at 9:00 A.M. or at the Viewing Tower in Qualicum Beach at highway 19a and Garrett Road at about 9:30 A.M.
Pacific White sided Dolphins at Neck Point: Janie Agar Photo. Please remember, when reporting a sighting, to leave your name and phone number, along with the date, name and location of your sighting. The Sunday Bird Walk went to Neck Point Park in Nanaimo. Among the highlights was the sightings of about sixty Pacific White sided Dolphins who spent the entire morning just off the point, moving back and forth feeding and displaying. We had a Yellow-billed Loon come in close to shore, a Horned Lark who landed on the Point to give us great looks and over two hundred Black Turnstones who lifted from the rocks in a large cloud as a Merlin flew past. Mallard, Surf Scoter, Black Scoter, White-winged Scoter, Harlequin Duck, Common Merganser, Common Loon, Pacific Loon, Double-crested Cormorant, Yellow-billed Loon, Pelagic Cormorant, Brant's Cormorant, Great Blue Heron, Bald Eagle, Sharp-shinned Hawk, Merlin, Black Turnstones, California Gull, Glaucous-winged Gull, Bonaparte's Gull, Thayer's Gull, Marbled Murrelet, Anna's Hummingbird, Belted Kingfisher, Northern Flicker, Pileated Woodpecker, Steller's Jay, Northwestern Crow, Common Raven, Winter Wren, Brown Creeper, Bushtit, Chestnut-backed Chickadee, Red-breasted Nuthatch, Ruby-crowned Kinglet, American Robin, European Starling, Spotted Towhee, House Finch, Song Sparrow, Fox Sparrow, American Pipit, Horned Lark, Savannah Sparrow, Dark-eyed Junco, Pine Siskin, and Purple Finch. A Pileated Woodpecker was seen at a suet feeder in the Harlequin Crescent in Nanoose Bay. Thirteen Brown Pelicans were seen at Port Renfrew. Over three hundred Pine Siskins and six White-winged Crossbills were spotted in the top of Cedar Trees in Errington. California Quail, two Steller's Jays, three Northern Flickers and a Silver Pheasant were seen in the 5200 block of Fillinger Crescent in Nanaimo. A Varied Thrush was seen in the 3600 block of Uplands Drive in Nanaimo. An Anna's Hummingbird was seen along Long Lake Road in Yellowpoint. Twelve Greater-White fronted Geese were seen at Fairwinds in Nanoose Bay. A Pectoral Sandpiper was seen at the Englishman River Estuary, Plummer Road side. Fifty-two Greater White-fronted Geese were seen at Columbia Beach. A Northern Pygmy Owl was seen along Nanaimo Lakes Road in south Nanaimo. Twelve Hooded Mergangers and two Harlequin Ducks were seen on the east side of Protection Island, south of Smugglers Park. The Tuesday Bird Walks will resume on October 21. Meet at the Parksville Beach Community Park at 9 A.M. The Tuesday Bird Walk on Tuesday October 21 will be going to The Englishman River Estuary, Shelly Road in Parksville. Meet at the Parksville Beach Community Park, meet near the Concession Building at 9 A.M. or at the end of Shelly Road off the Oceanside of Highway 19A. The Sunday Bird Walk on October 26, 2008 will be going to Nanaimo River Estuary in south Nanaimo. Meet at the Bird Store at 9:00 A.M. or at the end of Raines Road at about 9:30 A.M.
Northern Harrier: Ralph Hocken Photo. The Sunday Bird Walk went to Nanoose Bay. Among the highlights were the sightings of a Northern Shrike, two Merlin, a Red-tailed Hawk, Pacific Loon, Common Loon, and a Ring-necked Pheasant. Golden-crowned Sparrow, Savannah Sparrow, Dark-eyed Junco and Purple Finch. A Northern Harrier, Northern Shrike, a Western Meadowlark and two Lincoln's Sparrows were seen at the Nanaimo River Estuary in south Nanaimo. A hugh flock of Northwestern Crows, thirty birds wide and streaming past for fifteen minutes heading towards Nanoose Bay, was seen from the top Groveland Drive and Dickson Road in north Nanaimo, at about 6:00 P.M.
Over fifty Greater White-fronted Geese were seen on a newly plowed and seeded field on the Brannen Lake side of Doumont Road in north Nanaimo. A Snow Goose was seen in with the Canada Geese on the grass at Parksville Beach Community Park. A Townsend's Warbler was spotted in the 200 block of Dawkins Lane in Nanaimo. A Greater White-fronted Goose in with a flock of Canada Geese at the Parksville Bay Community Park. A flock of fourteen Greater White-fronted Geese, Canada Geese, fifteen Trumpeter Swan, Mallard, Northern Pintails, Green-winged Teal, Double-crested Cormorants, Pelagic Cormorants, Great Blue Heron, Bald Eagle, Greater Yellowlegs, Bonaparte's Gull, Ring-billed Gull's and Glaucous-winged Gull's were seen at Cowichan Bay near the Estuary. A flock of over fifty Greater White-fronted Geese were seen over Columbia Beach. A Sandhill Crane was spotted at the Nanaimo Dump from Cedar Road in south Nanaimo. 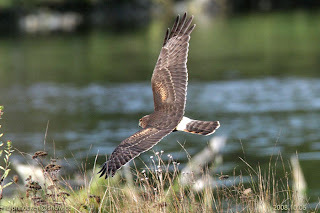 A Northern Harrier and a flock of Greater White-fronted Geese were seen flying over the Englishman River Estuary, Plummer Road side. A Great Horned Owl and a Fox Sparrow were seen alone Morrell Circle in Nanaimo. An Anna's Hummingbird is visiting feeders in the 700 block of Doehle Avenue in Parksville. The Sunday Bird Walk on October 19, 2008 will be going to Neck Point Park in Nanaimo. Meet at the Bird Store at 9:00 A.M. or at the Parking area at Neck Point Park off Hammond Bay Road at about 9:20 A.M.
Meet at the Parksville Beach Community Park, please park near the Concession Building at 9 A.M. or at the end of Shelly Road off the Oceanside of Highway 19A at about 9:15 A M.
Pink-footed Shearwater at Swiftsure Bank off Bamfield--September 28/08-Mike Ashbee Photo. The Sunday Bird Walk went to Bowen Park in Nanaimo. Among the highlights was the sightings of a Hermit Thrush, an Anna's Hummingbird, Downy Woodpecker, Hairy Woodpecker, Red-breasted Sapsucker and several Northern Flickers. Purple Finch and Pine Siskin. An Evening Grosbeak was spotted at feeders along Boundary Crescent in Nanaimo. A White-throated Sparrow, a Merlin, a Northern Harrier, a Ring-necked Pheasant and fifteen Greater White-fronted Geese were seen at the Nanaimo River Estuary in Nanaimo. A White-breasted Nuthatch was seen visiting feeders along Stevenson Point Road in Nanaimo. One Yellow Warbler and four California Quail were seen in the backyard in the 2500 block Glenayr Drive, in Nanaimo. 400 to 500 Pacific Loons and 100 Red-necked Grebes were seen off shore at French Creek. An American Dipper was spotted at the base of the upper dam at the Colliery Dam in Nanaimo. Ruffed Grouse were seen at Morrell Sanctuary in Nanaimo. Two Great Horned Owls were seen and heard along Morrell Circle in Nanaimo. A Barred Owl was heard calling and Red Crossbills were seen in the 800 Block of Harwood Mines Road in Nanaimo. 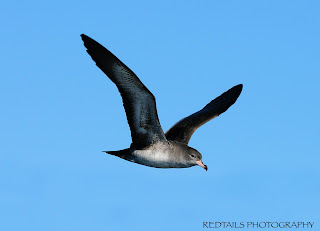 Fifteen Flesh-footed Shearwaters, two Short-tailed Shearwaters, eight Buller's Shearwaters, thousands of Sooty Shearwaters, thousands upon thousands of Pink-footed Shearwaters, two Northern Fulmars, two South Polar Skuas, ten Pomarine Jaegers, three Red-necked Phalaropes, six Bonaparte's Gulls, thousands of California Gulls, hundreds of Heermann's Gulls, several Herring Gulls and hundreds of Glaucous-winged Gulls were seen on a Pelagic tour that went from Sooke to offshore of Bamfield at the Swiftsure Bank. The Herring fish had pushed the Krill to the surface and as a result there were at least three hundred thousand pelagic birds as well as fourteen Humpback Whales in a massive feeding frenzy. "Use wind power to reduce electrical consumption at home". The Sunday Bird Walk on October 12, 2008 will be going to Nanoose Bay. Meet at the Bird Store at 9:00 A.M. or at the Parking area behind the Church Camp (off Highway 19 and Arlington Road) at about 9:20 A.M.
Fifteen Flesh-footed Shearwaters, two Short-tailed Shearwaters, eight Buller's Shearwaters, thousands of Sooty Shearwaters, thousands upon thousands of Pink-footed Shearwaters, two Northern Fulmars, two South Polar Skuas, ten Pomarine Jaegers, three Red-necked Phalaropes, six Bonaparte's Gulls, thousands of California Gulls, hundreds of Heermann's Gulls, several Herring Gulls and hundreds of Glaucous-winged Gulls were seen on a Pelagic tour that went from Sooke to offshore of Bamfield at the Swiftsure Banks.